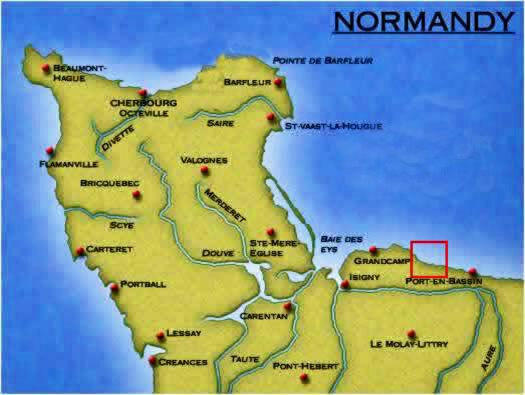 Wn64 St-Laurent-sur-Mer est, K.V.U. Gruppe Percee, Normandie. 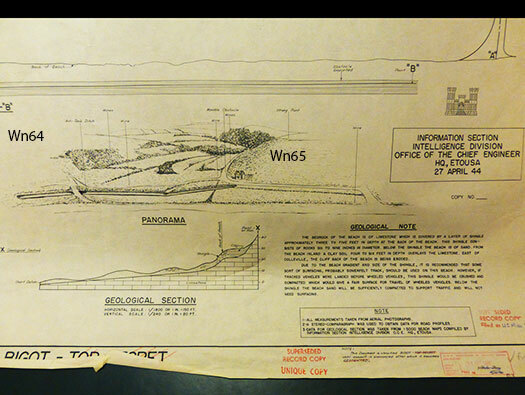 Wn64 was quite a small defence above the valley of the le Ruquet River Valley. Originally it was a defence using trenches and earth bunkers, when later two Tobruk´s were added, two Feldmässig bunkers and a 7.62cm Infantry field gun was added. Later an R612 casemate was being built. 1 x 7.62cm I.K.H.290(r) Infantry Howitzer. 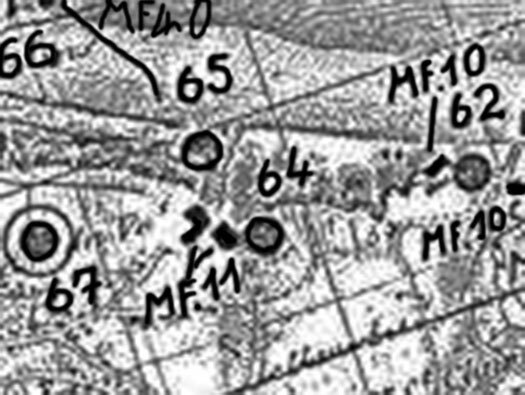 This is the German map of the defences around Wn64. To its left covering the road are two minefields MF11. 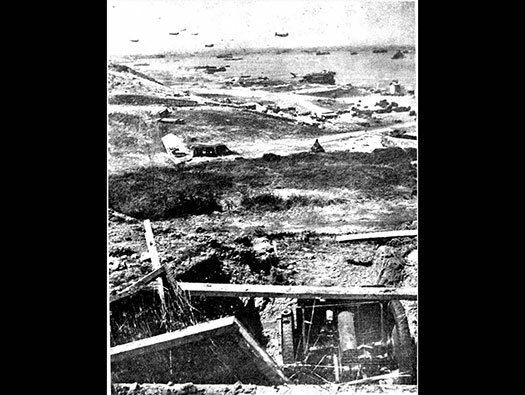 Laying a minefield both sides of an anti-tank ditch. S mines ready to lay. 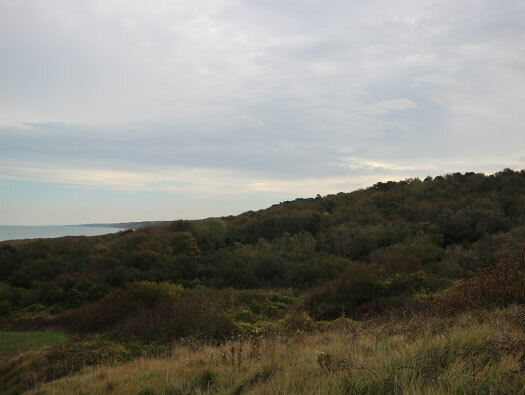 An R612 casemate under construction is about the middle of the photo, I did try to get up there in October but the undergrowth was way too thick. I will try before the spring. This Wn is set quite a way back off the beach, it was planed before 1943 and before Rommel took over. He ordered that the defence had to move forward closer to the beach. The infantry position did stay up on the hill but the small Infantry Howitzer was placed well forward to control the valley (Draw) and then an R612 was being built either for the Infantry Howitzer or a larger Field Gun. 7.62cm I.K.H.290(r) as a horse drawn field gun. An R612 casemate under construction upper right side. 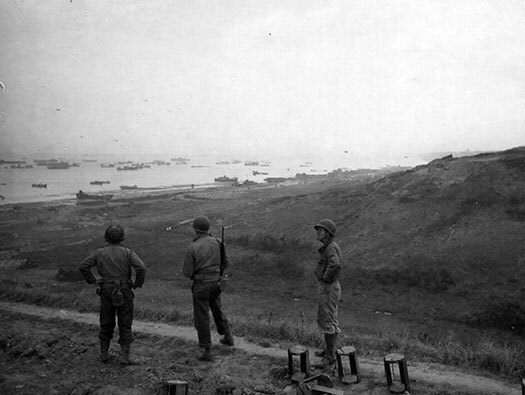 You can see the main defence on the hill and the R612 under construction or it may be the position of the 7.62cm F.H. covering the valley. 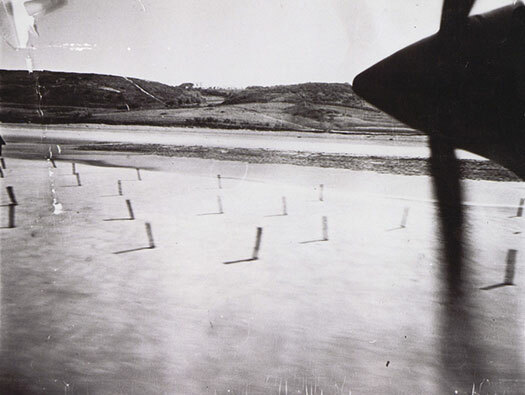 The main defence is dated at 1943 and the date of this photo. The anti-tank ditch not built yet, that was built early 1944. Design of an anti-tank ditch. 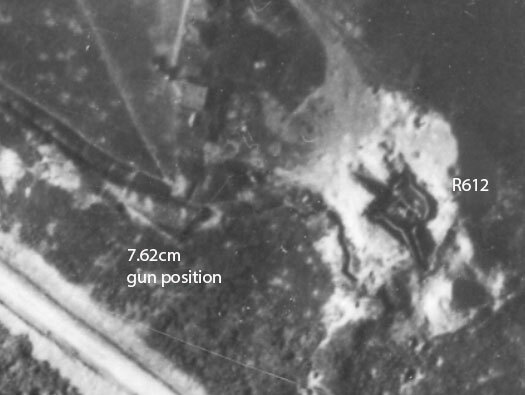 This is an air photo taken post D-Day probably July 1944 showing the construction in Bauform. R612 under construction (construction No.Bw.486). What a strong position, if a field gun had been set in here it would have been able to fire across the le Ruquet River valley. Looking out of an R612. This is the field position probably built by the gunners to camouflage their gun. It must have done some damage across the valley, I do not know how many rounds were fired. Infantry companies/platoons that held a position were issued heavy weapons as they came available. These were not fired by artillery troops but by infantry men trained in that role. It would have made them slightly less affective than they could have been. An ammunition niche at Wn62, these were a local made storage of any ammunition and quite a few are in this eastern end of the defence. 716th Static Infantry Division (Wehrmacht), 726 Infantry Regiment. 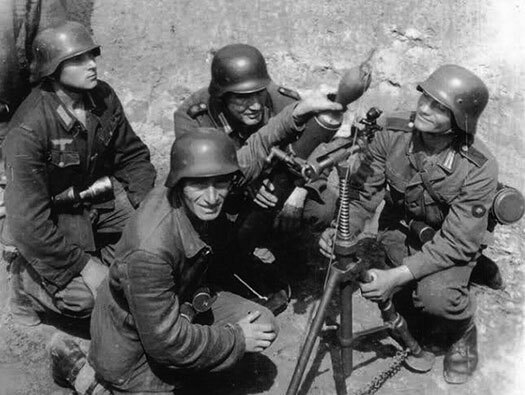 716th Static Infantry Division (Wehrmacht). Now up on the hill the original and main defence. A trench system laid out in a circle with 2 Feldmässig bunkers as living accommodation, two defence Tobruk´s and two 8.14cm Mortars. 8.14cm or 81mm Gr.W.278(f) a captured French Mortar. The crew are training with a wooden mortar bomb and you can see a piece of string to extract the bomb out of the barrel. These mortars were very effective and would have made life on the beach very difficult. The bombs hitting the shingle would create metal and also stone shrapnel flying all over the place, killing and injuring many Americans. 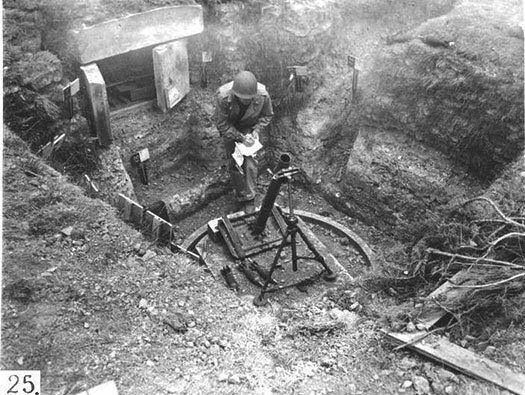 This is one of the positions for an 81mm Gr.W.278(f). It looks like a concrete base to sit the base plate of the mortar on and it looks like a sort of turntable. Behind an ammunition niche to store the mortar bombs and any spare parts. A plan of the beach that may have been used by the gunners. A call for fire in a certain area could be called down buy an observer and he would say 'Target B', the gunners would then move the barrel around to line up with pre determined marks in the mortar pit and a pre set sight. and fire could come down very quickly. 81mm Gr.W.278(f) broken down for transporting. Two Tobruks were placed covering the rear of the defence but could probably bring their guns to bear on the beach. Lightening of the 7th photo Reconnaissance Group at RAF Mount Farm. 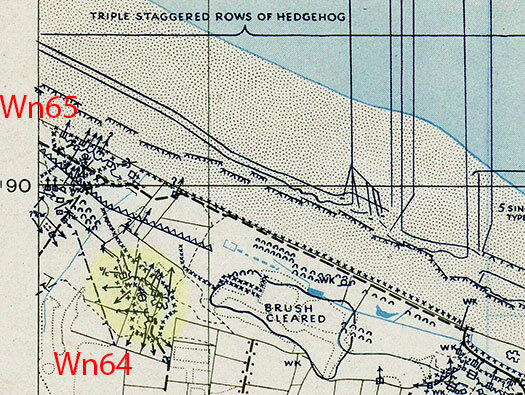 Bigot map of Wn64 showing the anti-tank ditch, the barbed wire and possible machine gun positions. This is an artists impression of the E1 Draw le Ruquet River Valley. From aerial photos. It tells of the shingle and sand beach, that if tanks cross the shingle it will be compacted to allow wheeled vehicles to cross. It does say that Sommerfeld Tracking may need to be used. 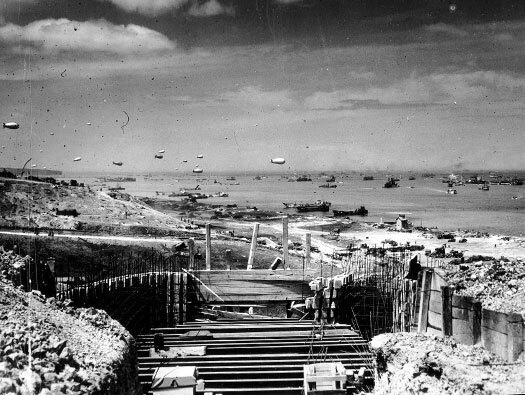 From the obituary of Donald McColleville "Several beaches were targeted by the samplers, both in an effort to find suitable sites and also to confuse German commanders about where landings might happen". "They would approach the shore in small boats with silenced engines, before swimming or going in a canoe over the final distance". "To take the samples they would turn an auger screw into the beach and put sand into pots, and then head back to England." Bong stick ?? I wonder what that was. Yorkshire-born Major Donald McColville and served with the Royal Engineers in WW2 would visit beaches at night and creep u the sand and take samples. Bring them back and write a report on the beach. 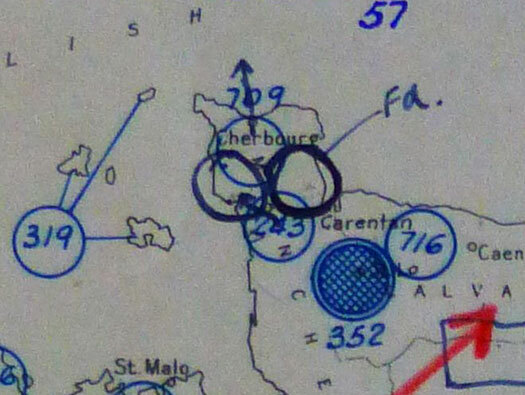 This is the D-Day Naval Bombardment Schedule plan for Omaha beach showing the ships that will target the areas of Wn64. 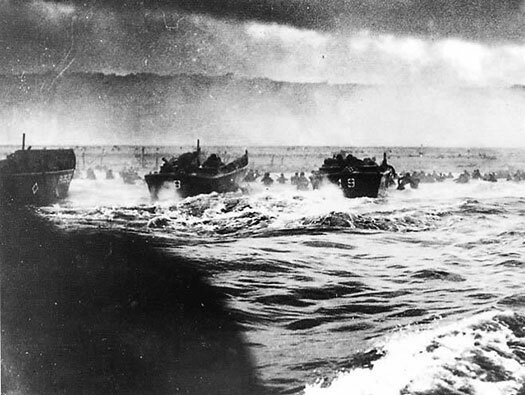 LCVP's running into the beach. 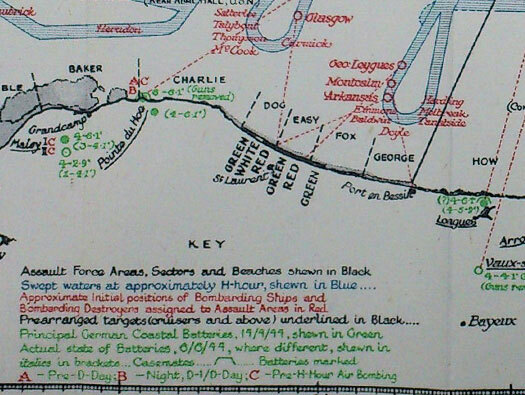 Map showing the German defences and then the Americans beach names. Here we are looking at Easy Red and E1 Draw (le Ruquet River valley). Lt Spalding E co. 16th Inf. 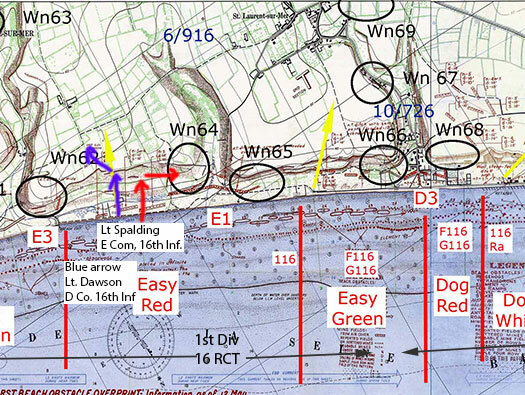 landed (red arrow) at about 06:45 through very deep water and managed to get onto the beach with his 32 men boat group. 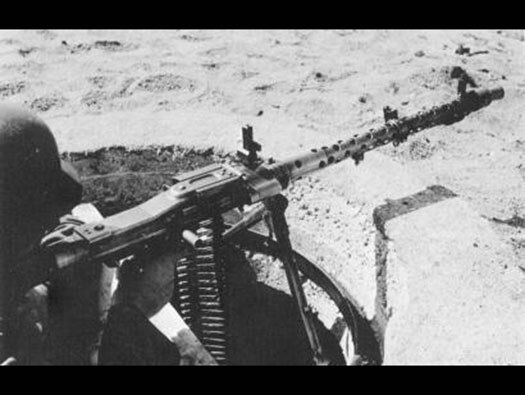 As they made the drier sand, mortars & machine guns at long range started hitting them. They managed to reach the Roman ruins, muddy marshy and overgrown inner beach, helped hide the soldiers. There was a ravine that would take them up to the top of the grass covered cliff. Following paths up the slope and looking out for mines. 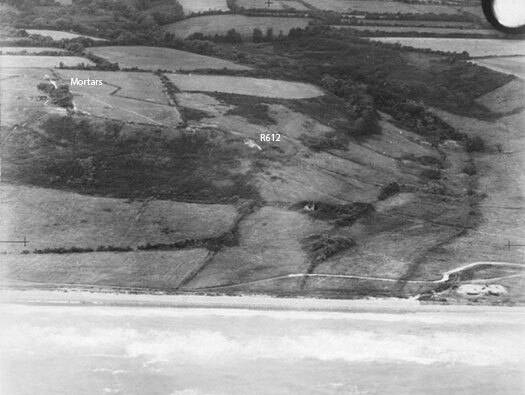 Gun fire was coming in from Wn64 but was spasmodic as they were probably also shooting at any troops along the beach under their position. At the top they turned right and advanced on the machine gun and Wn64. They rushed the gun and managed to take the gunner prisoner. When interrogated, they found he was Polish and had been forced by a German NCO to continue firing. 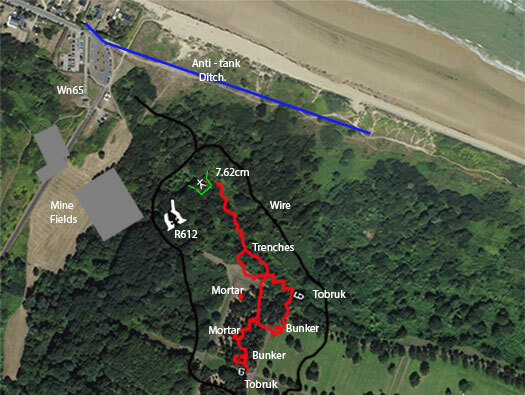 The blue arrows was the route of Capt. Dawson of G Co. 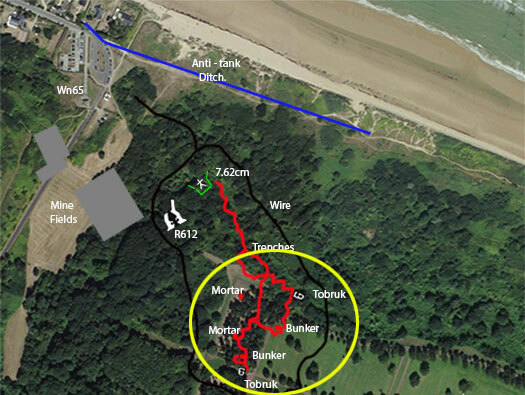 They advanced parallel to Spalding and took out a machine gun with a hand grenade in a position at the top of the path. Both groups continued into the hinterland. Machine gun on the bluff. 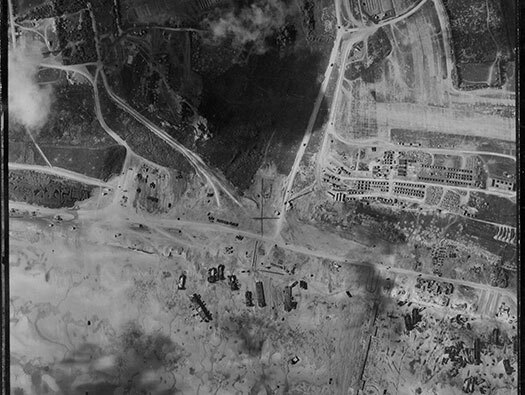 Air photo 1944 of E1 Draw with tents, vehicle, track ways filling up the area.